As Adam Sandel documents, the subject-object distinction is quite historically young. Its rise began largely with Bacon and Descartes and some of their contemporaries, and was extended and adopted by thinkers for centuries after, until it became largely a background assumption. But what are these things we call subjects and objects? The subject is supposed to be the thing with internal perceptions—whatever, whoever is perceiving or acting upon the object. Bacon was the father of the empiricist school. They believed some version of the claim to the properly understand objects, you had to purify your thoughts of all preconceptions and simply perceive in an unbiased manner. Opponents of this school joked that David Hume, a member of it, could not know what he was eating until after he had eaten it. Descartes was the father of what was called the rationalist school (though this gets confusing, as “rationalist” has been applied to many different sorts of thinkers throughout history and from a certain point of view Bacon most certainly was one). This specific rationalist school was differentiated from the empiricists because they believed that the proper way to understand objective reality was to identify the correct logical basis for interpreting it a priori, or before experience. Thus Descartes is most famous for embracing radical doubt about the reality of all perceptions in order to try and flesh out anything that could withstand such scrutiny; he ultimately “discovered” that in order to doubt at all there must be a subject that exists to do the doubting. “I think, therefore I am.” From this he attempted to build reality right back up from the ground. Few think he succeeded. But as Sandel emphasizes, both schools believe that the mental and emotional baggage that subjects bring with them when they observe objects are distortive and need to be purged. We must start fresh and make ourselves unbiased if we are either to observe reality as it is, or identify the correct first principles which will disclose to us the truth hidden behind mere perception. The initial baggage is nothing but mere prejudice and superstition. Alasdair MacIntyre claims that by the 19th century, this view had culminated in a shared belief in the unity of all knowledge, whether about the physical world, about human society, or about morality. He documents how the authors of the ninth edition of the Encyclopedia Britannica really believed that all knowledge could be boiled down so that any educated person, not just specialists, would be able to access the very frontiers of knowledge uncovered in every field. Moreover, they believed that all scholars were making contributions piece by piece to something that fit together into a coherent whole. The idea of rival, clashing frameworks with distinct claims to truth that did not harmonize well was absent; differences were written off as misunderstanding. This worldview rested on the assumption, as Karl Popper put it, that truth is manifest; that it merely needs to be uncovered in order to be recognized for what it is. In other words, the mainstream belief among the children of the Enlightenment was that objective reality could be readily perceived by subjects, and all that remained as to get to work uncovering it. At this time, a reaction was already building against the Enlightenment orthodoxy. This reaction has been called romanticism as well as historicism. In this view, we cannot simply perceive what is “out there”; all we have are our subjective mental processes, which are molded entirely by our particular moment in history, as well as our region, culture, and so forth. Though these things act upon us, we don’t necessarily perceive them in ourselves. And the only reality, for us, is what we perceive. There’s no “underneath”, because how would we know of it, except by perceiving it? In a world of subjects and objects, how can we even talk about objects except as things we perceive? If we are subjects, then all of our experiences are subjective; to speak of an objective experience is a contradiction in terms. The world of the romantics is, contrary to the authors of the ninth edition of the Encyclopedia Britannica, radically fragmented across every individual subjective experience. If there are commonalities, they are purely situational—human beings being similar enough that we can speak of shared subjective experience by people in the same culture, the same place, at the same moment in history. Historians then set about interpreting primary documents by attempting to understand how the authors of those documents would have subjectively understood the meaning in its specifically historic context. Of course, the very idea of being able to enter into or understand a historically specific subjective point of view contradicts the whole particularity of the romantic framework. If we can stand back from our own perspective and enter into someone else’s, then doesn’t the theory of a unified knowledge become plausible again? The struggle between an implausible God’s-eye-view, unified objectivism on the one hand, and a romantic notion that we’re trapped inside of radically individuated subjectivities on the other, has characterized a great deal of Post-Enlightenment philosophy. A different distinction emerged in the 20th century, which nevertheless built on rather than replaced the subject-object distinction. This is the idea that there is a space “between” subjects, as well as an ontological status looser than hard-objectivism but harder than pure subjectivism. John Searle famously formulated this as “ontologically subjective, epistemologically objective,” or an “institutional fact” such as the fact that a dollar bill is money, as opposed to a “brute fact” such as the existence of a mountain. 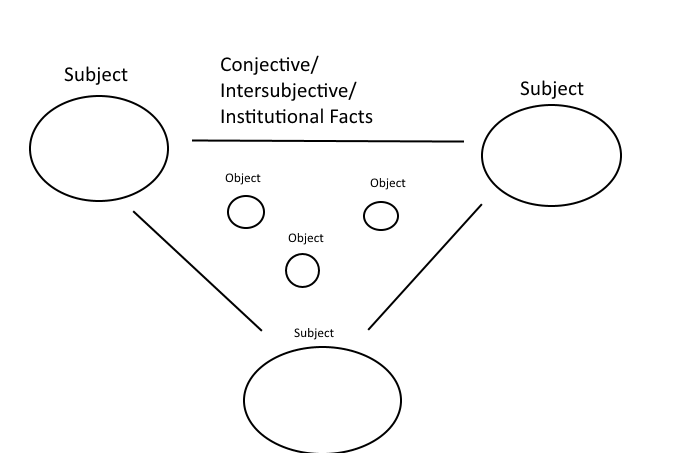 Deirdre McCloskey calls this “conjective” as opposed to subjective or objective, because it involves what we can only know together as opposed to as individual subjective minds. Jürgen Habermas called it “intersubjective” and it plays a crucial role in his normative framework. The dollar is Searle’s favorite example. It is an undeniable fact that if you take some specific pieces of paper to a store, you can get things for them. There’s nothing in the objective properties of the paper that makes it so. But this isn’t just subjective—you or I couldn’t just decide we don’t feel like those pieces of paper are money any more, and change their status by doing so. Someone else could come along and pick up the paper we threw on the ground and still be assured they would be able to swap it for something else they want. The paper’s status as money is a harder reality than what we think of as subjective. Yet as McCloskey emphasizes, this status is contestable. It’s just that the attempt to change its status has to be very widely adopted before it is successful; you cannot simply persuade one or two people. Indeed, if you succeeded in persuading two or three people that dollar bills are “just paper,” those three people would simply have inaccurate beliefs. It isn’t until basically everyone has changed how they treat those pieces of paper that any of them could be considered correct in believing such a thing. In fact, all but the most trivial of human knowledge is conjective rather than subjective. We only recognize a mountain as a mountain because we have a language to describe it. Otherwise it is just visual thing in the distance. So much of understanding of the world around us depends on concepts that we learn from what other people say and how they behave that this aspect of understanding becomes almost invisible to us. It’s just obvious that a dollar is a dollar, that “to google” means “to use a search engine,” and that it’s inappropriate to blow a raspberry loudly in polite company. It’s so invisible, and the subject-object distinction so universally adopted at this point, that it was asserting this very concept which provoked someone to accuse me of magical thinking. One wonders whether the concept of “magical thinking” was something that just subjectively emerged within their individual brain, without any mediation on the part of the people around them. A different distinction entirely than subject-object is the distinction between parts and wholes, existing in a relationship in which neither can be disentangled from the other. In short, a holistic relationship. The parts can only be understood in terms of the whole, and but we only ever encounter the parts. So we learn about the whole through its parts, which only makes sense in term of the whole. Martin Heidegger really embraced the circular nature of this framing, while his student Hans-Georg Gadamer made it less circular, and more a process of constant revision. Gadamer stood as a stark opposite to both Bacon and the empirical school, as well as Descartes and the rationalist school. Unlike both of them, he believed the only way to begin a process of observation and interpretation is by starting with presuppositions and prejudices. For Gadamer, when reading a text (an even more central case for him than the dollar is for Searle), we come with certain notions about the whole of which the text is a part. So if we’re reading John Locke, we might have some prior ideas about the British empiricist school as well as the contractarian framework of property and government. When we actually read the text, however, we might be surprised to find that our expectations were not met, and be forced to revise our understanding of those schools, our prejudices about Locke, and maybe even his relevance to matters outside of the box we had pigeonholed him into. Heidegger and Gadamer are two among many who attempted to dethrone the primacy of the subject-object distinction in order to elevate the part-whole distinction. To my way of thinking, both are useful, but the part-whole distinction has more resources to deal with the problems of the subject-object distinction taken alone. It’s also not that hard to combine them, as well as the conjective account—subjects stand in a relation to objects as well as other subjects. This relation is defined by the whole to which all are parts. Or not—the subject-object distinction is not destiny. At one time, it was quite novel. Its importance for science is, I would argue, very overrated. I say this without denying that it is nevertheless quite useful. But I stand with Heidegger and Gadamer and a whole host of other 20th century philosophers who believe that we’ve taken it well beyond where it is useful, to a point where it begins to create big blindspots. Another distinction of interest is between substance philosophies, like Aristotle’s, and process philosophies, which Heraclitus is usually given the credit (and blame) for. Substance philosophies are pretty straightforward. There are things. We want to know the properties of those things; their essence, their form, their causal relationships. It’s not hard to see how this eventually collapsed into the subject-object distinction, though it certainly did not begin that way, and it did not get there for nearly all of its history. Processes are hard to talk about without some provisional substance placeholder. But let’s consider it in terms of questions rather than assertions. Most people take it for granted that groups exist. Libertarians, as well as economists and social scientists committed to methodological individualism, cry foul here. Only individuals decide, they argue. A “group” is just a shorthand for a bunch of individuals. Maybe they look cohesive because of economic and social processes, but individuals and processes are all that there is. But wait a minute. What the heck is an individual? Aren’t they just a cluster of cells that turnover on a regular basis? Aren’t they just a bunch of atoms, 98 percent of which have moved on by the end of a year? And what are cells, but molecules and atoms? And what are atoms, but subatomic particles? At any level of substance, isn’t there just some process going on that makes the thing look like a thing? Aren’t processes the only thing truly real, in the end? There’s no small part of me that thinks this perspective is the most true of all, in some fundamental sense. The whole exists, and what look like parts are really a series of ongoing processes. Substance philosophy, the subject-object distinction, even the conjective distinction and the very idea of parts of the whole, seem to me valuable on pragmatic grounds. As humans, we see things as things. We have subjective perceptions. We see other humans. We have conversations with those humans, and interpret what is said in light of a conjective sense of meaning. It doesn’t really make sense to try and get around in the world and live our lives without these extremely useful ideas, distinctions, and taxonomies. But way down at the ontological ground, if it is meaningful to speak of such a thing, there is the whole and then there are the processes within it. Can I please post this (with attribution) on a philosophy forum? Sure! Could you share the link here afterwards?